The Athlit Beachstormer Connector, or BSC, is the first landing vehicle created by Halcyon Arms. Whereas older LCACs are only able to carry a single tank, the BSC is able to carry four to six main battle tanks. 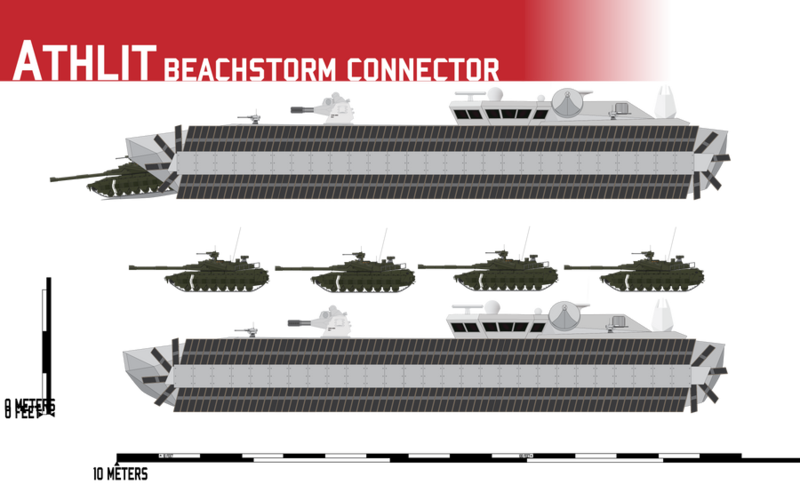 What it makes up for in weight-capacity it loses in deck-space that an equal-sized LCAC. The Athlit Beachstormer Connector utilizes air-filled foam treads lined with kevlar as "paddleboat treads" allowing the vehicle to traverse both water and the vast majority of terrain with less pressure than a human footstep, including mud and ice. Last edited by Pharthan on Sun Dec 14, 2014 12:43 am, edited 6 times in total.